Below we have included a selection of our guest s comment s as they have left them in our guest book. I hope they help to tell our Story. Where to begin? Thank you so much for supplying a fully furnished get-away. Your style is to die for. We've enjoyed lounging about and walking around in this scenic area. Even the leeches were polite enough to say 'hello'! We'll definitely be back to admire the lichen and staghorns and hopefully go swimming that time (too cold this time round). Also, your shower design is divine. Kudos! "Thank You! Thank you once again for sharing this most amazing, secluded spot with us! We absolutely love spending tiem here. It is so relaxing, reinvigorating, refreshing - goodness the list goes on ..... it is perfection! The guest book and reviews are a testament to you Brad and Mark and the unique haven at 'serenity' that you so lovingly created and continue to develop. The words we pen here, accompanied by the photos and meaningful memories we shall depart with tomorrow, cannot quite capture the magic this place conjures up. We have indulged in such wonder and luxury during our stay here: rock-clambering, creek-dipping, wildlife-watching and re-connecting with nature, adventure and one another. The and comforts of Serenity, from the shower to the stove to the extra touches, have provided the perfect setting for love and celebrations. Thank you. We hope to return to the comforting calm of this cabin by the creek! What a beautiful place to spend my B-daY. Love the sounds, the echo feeling, we had such a lovely & relaxing weekend, great views, we are definitely coming back. What a lovely 2 days we have had, we very much regret not booking longer! Thanks for the advice on the hike Mark, we loved the rock hopping. 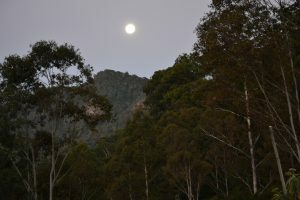 We have stayed at many cabins + cottages throughout Queensland and this is an absolute stand out for us. The finishing touches are superb! This is not just a holiday accommodation, it is an experience! Well done - thank you. This is truly one of the most magical places we have ever been. We wanted some place secluded and romantic, somewhere to reconnect and relax. we got that, and the cottage and surrounds exceeded expectation. We wanted for nothing and the attention to detail was amazing. We loved every second at Serenity and will definitely be back. Serenity and Surrounds has consolidated our wish to find a place just like this for us ... 4 ever! Thank you so much for creating suxh a beautiful wilderness haven here have been absolute bliss. from the sounds of the creek to the birds to the rain falling on the roof we both feel utterly relaxed+ regretful that we have to leave. Everything has been so well thought out. from the fully equipped kitchen to the reading nook to the fire pit. We have utilised every feature + even enjoyed a dip in the creek. Once again we had returned back to our faourite retreat. When we are stuck in the hussled world of city life, something digs deep inside .... yearning to retreat into another world where street lights aren't blinding you and the thousands of minds chattering around you aren't drowning you so........ this place always helps you find your true self again! Thanks! ...Always looking forward to coming back home to Us! Me! There are many more reviews in our guest book. I hope you enjoyed the small selection and it informs you a little about us. 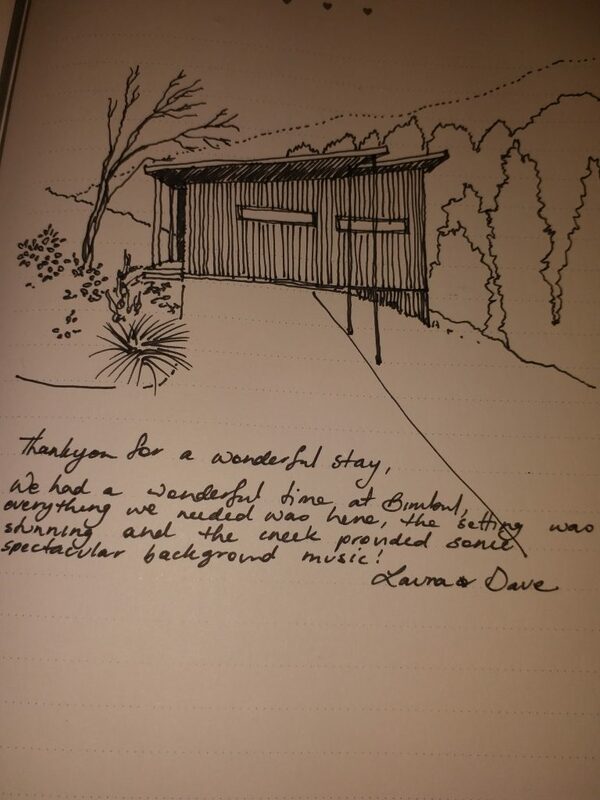 We look forward to you having your own experience at Wongari Eco Retreat and reading the guest book for yourselves - maybe leaving your own comment.